I have a Slim Phatty which recycles the knobs...it gets the job done, but it isn't my preference by any stretch. I also like being able to look across a synth surface and see how things are set (which is harder to do when a knob is recycled for multiple purposes). So...I do prefer the dedicated knobs myself. I completly agree. My first synthesizer had one knob for each function and the latest one has something like 6 knobs for all functions. Things would be easier if I had an editor for it. Yeah, so what? I want to control each oscilator, each enveloppe generator and each filter seperatly, just like I would do wich each channel of a mixer. All channels may be the same, but if I want to bring down the volume of one channel, I still need seperate knobs. I'm speaking in terms of knowing what each control does. If one knows what the coarse tune knob on one oscillator does, one automatically knows what the coarse tune does on the other oscillator. They do the same thing. Likewise, if one knows what the midrange center frequency knob does on one channel of a mixer, one automatically knows what that knob does on the other 47 channels. If a mixer has 25 controls for each channel, times 48 channels, that's a total of 1,200 controls. But one doesn't have to learn what 1,200 distinct controls do, one only has to learn what 25 distinct controls do. Knowledge of those 25 controls transfers to the next channel over, and the next, and so on. Last edited by progmatist; 01-13-2017 at 12:50 PM. Now I understand. It is just more knobs doesn't make it more complicated. Took some time to get used to the layout (it is closer to a guitar fretboard than a piano), but once I got the hang of it, it's fantastically versatile. I actually use it mostly with the Arturia CS-80, with the Y-axis controlling the cutoff and a full 12 note bend range. It's not perfect but is damned cool. Wow, that looks fascinating! I have a stack of stuff and try to keep up with new things but i missed this. I look forward to looking at the demos. I discovered it via an online article about new MPE (multidimensional polyphonic expression) controllers, and it was both one of the more affordable and also intriguing. I've only just scratched the surface of mine; for example, I've not nearly explored all the polyphonic aftertouch possibilities. But I loved that it pushed me out of my "comfort" zone and thinking about performing in a different manner. If I *did* have that sort of disposable income though...honestly I'd probably just go for a genuine/restored Yamaha CS-80. I have the Arturia equivalent and it's peachy but not quite the same tactile experience. The CS-80 is probably the most beloved synth of its era, perhaps of all time. I still remember that Garth Hudson loved his so much he had it tricked out with a liquid cooling system (like gamers are fond of modding their PCs with these days) to make it more reliable and road-worthy. I think it was the smaller brother of the GX1 Keith Emerson used. Dorothea Raukes (Streetmark) used one. Her solo-album Deutsche Wertarbeit is just Korg. Not gonna lie...pants go a little funny-feeling, seeing those synths in action. And the song also features CS-80 on the intro! 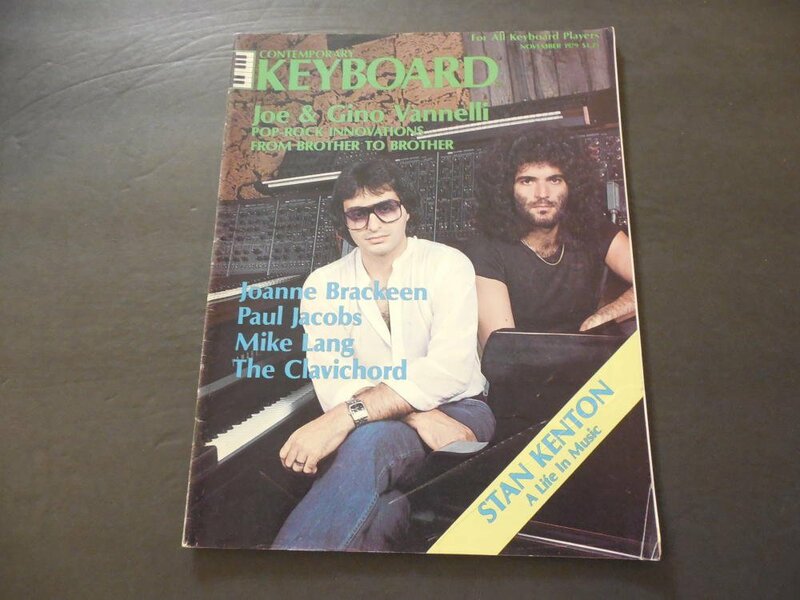 I have a Contemporary Keyboard magazine from November 1979, which features Joe and Gino Vannelli on the front cover with some Korg polyfonic synthesizers on the background. I think I can also see a MS20 on top, but I'm not sure of that. I am saving up for the big one. It would never replace my traditional keyboard controllers because of my classical repertoire. But for delivering realistic performances of strings and woodwinds, it would be the cat's meow. As well, any "synthy" sound would be great on it. The best CS-80 I know is Eddie Jobson on UK's first album. I've read an interview in which he stated it was more trustworthy than the Prophet 5. So what other boards/modules does the Battema battery include? Thank you for the list and the pics! It looks like a great collection and a very workable studio. You have a great Moog presence there! But the Karma just gathers dust? I really enjoy mine; I like the Karma features on it and my M3. The Karma is a great keyboard and I used it lots over the years. But, I also have a number of software synths (the V-Collection, Spectrasonics Omnisphere/Atmosphere, M-Tron, Dimension Pro, Rapture, some Native Instruments), and I gradually realized that I was getting the same sounds from the software devices, using the Karma less and less. So, to free up some space I decided to move that into the closet. Gotcha. I have not dipped into the virtual side of things yet. With a decent machine and some reasonable CPU power, you can do some remarkable stuff with software synths. I find they are replacing the more sample-based hardware devices I use, save for some very specific sounds that resonate with me (especially some of the core sounds in devices like the U-220 and JV-880). A package like Spectrasonics Omnisphere can rival the best, most lush textures from the hardware devices like a Fantom or Karma. That is an excellent approach. And as stated by others, there is nothing like having a synth with lots of knobs and/or patch cords. I started on an ARP 2600 so I have a soft spot for patching together a sound.